New York: Perennial Library, 1988. 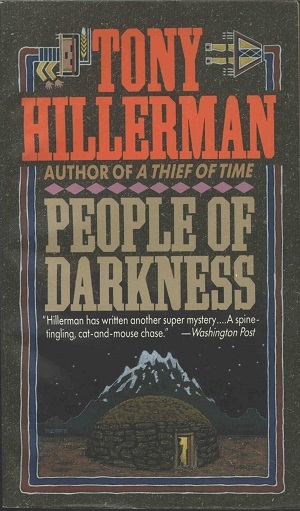 The Perennial Library paperback edition of Tony Hillerman's People of Darkness (1980), the fourth novel in his Navajo Detective Series. People of Darkness introduces Sergeant Jim Chee of the Navajo Tribal Police, a younger and in some ways more traditional Navajo than Joe Leaphorn. The book cover design and illustration is by Peter Thorpe, who began designing for Hillerman's novels in 1986. Although this is one of Thorpe's earlier designs, what becomes known as the iconic look of Hillerman's books, and Thorpe's design, is readily apparent: a symmetrical center graphic of a Southwest landscape, framed by a schematic of a yei figure taken from Navajo sandpainting. In this case, Thorpe places a male hogan in a low, barren landscape, while in the background snow-covered peaks loom against a star-filled night sky. The mountain and its adjacent horizon line of silhouetted mesas is supposed to evoke Mt. Taylor, the Turquoise Mountain, north of Grants, NM. Mt. Taylor literally blew its top eons ago, with the resultant lava flow becoming part of Navajo cosmology. The mountain in Thorpe's illustration, however, retains a sharply defined peak.